Create a New Job and Add Points into it. Calculate points using Bearing and Distance, Bearing and Multiple Distance, Radiate, Intersection of 2 Bearings and Parallel Offset. Add Strings, Curved Strings, and Change existing Strings. List out String definitions and Areas. Start CDS from the Programs Menu, or from a Shortcut if you have taken the trouble to establish one. In this example, you will learn how to start a Job from scratch, rather than work on an existing job as you did in the first example. You wish to start new Job with an ID of "IN2", and you should store it in the folder “Foresoft\cds2\Tutor, so make sure the folder is set to that location and type in a Filename of "in2" to replace the ‘*.data’ which appears. Now Maximise Job IN2 so it fills the screen. At this stage the screen is still blank as there are no points in the job, but we will soon rectify that by adding a start point, and then calculating some points from it. If you wish you could simply add points into a job by clicking on the screen, but before you can achieve this you need to be in Add Mode. If you pull down the Points Menu, you will see the option for Add Points, and you should select it. You will notice that your cursor now becomes a cross rather than the arrow you had previously. If you watch the Status Bar at the bottom of the screen as you move the cursor around you will see that the coordinates update as the cursor moves around the screen. We wish to Add in Point 1 with coordinates of East 200 and North 300. You could, if you wanted, move the cursor carefully until those coordinates were displayed, and then select the point, but it is not very practical to do so. Instead you can simply position the cursor somewhere near where you want the point to be and select a point by pressing the Left mouse button. A dialogue box will appear as seen below, and you should simply type in values of 200 for East and 300 for North and then Select OK.
Point 1 will now be saved with exactly those coordinates. You now wish to add another point being Point 2 with coordinates of E 450 and N 500, so repeat the process and type in the relevant values. Note that in this case we have chosen arbitrary coordinate values with relatively low values, but the process is exactly the same no matter what the coordinate values you wish to work with. If the points you enter do not at first appear on the screen simply use the Zoom Extents function that you learnt in the first example and they should appear when the screen is redrawn. Now that we have two base points to work with, we will be calculating other points rather than adding them, so pull down the Points Menu and turn Off Add Points by selecting it. Now pull down the Cogo Menu and select Bearing & Distance. A dialogue box will appear as seen above. This box is covering the area where you wish to calculate points, so drag it to the right hand side of the screen so it appears as seen at right above. 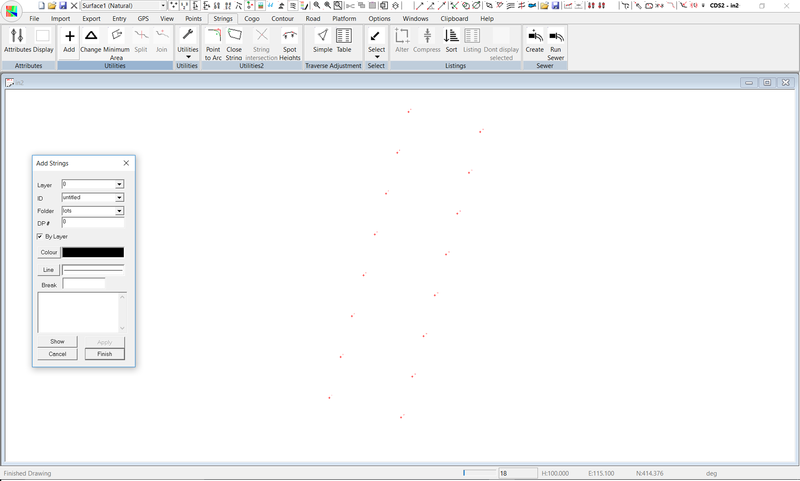 You will see that the cursor is flashing in the field titled “From Point, and here we wish to calculate some points from point 1. You may either type 1 in the field, or if you prefer, you can select the point on the screen with your cursor (which you might note is now back to an arrow since you have left the Add Points mode). Now you need to enter in a bearing, and here you wish to use a bearing of 15°30’, so type 15.30 in the bearing field and then press the Tab key to move to the Distance box. You will see that the program is suggesting that the new point should be number 3, and we are happy with that, so click on the Apply button and you will see point 3 appear on the screen. If you look now at the dialogue box, you will see that the “From Point” has changed to 3 and the new point has changed to 4 which is what we intend. Both bearing and distance fields have retained the values you used, so if you wish to calculate another point along the same bearing at a distance of 20 metres on from point 3 you need only select the Apply button. In this example, that is exactly what we wish to do, so click on Apply and you will see Point 4 appear on the screen. This method is fine if you only have one or two ‘frontages’ you wish to calculate, however in this example we need to calculate another 5 points along the line, and there is a more efficient way to achieve this that by clicking apply five times. If you look below the “Apply” button you will see a field titled Multiple. 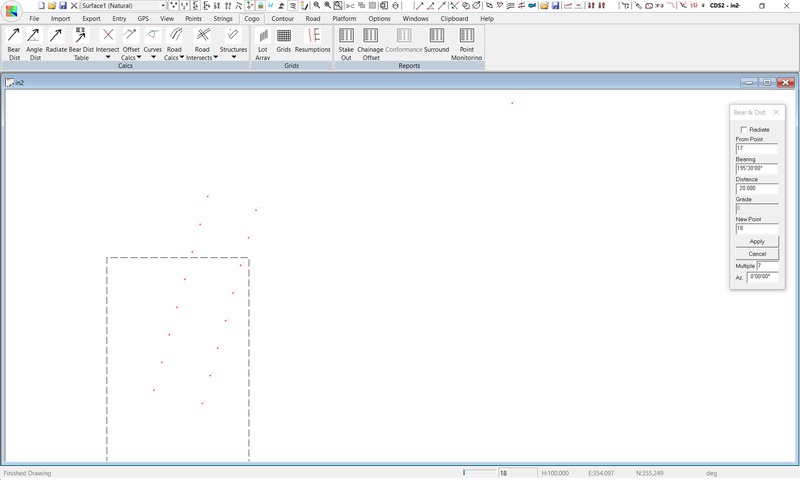 It is designed to be used where you wish to calculate multiple points along the same bearing, each the same distance apart which is something which surveyors need to do regularly when designing subdivision layouts (and Engineers do when laying out buildings, footings and the like). In this example we need another 5 ‘frontages’ so enter 5 into this field and then click on Apply. You will see points up to point 9 are calculated and stored. Now we wish to calculate a point on the back boundary of these blocks of land that we are attempting to set out. 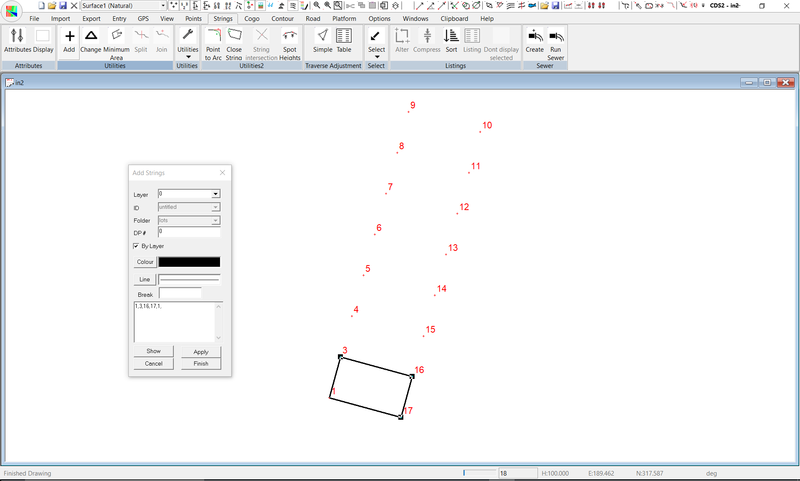 Position your cursor in the Bearing field that should still show 15.3. You wish to enter a bearing that is at right angles to that bearing, so you can do the ‘quick sum’ in your head, or, while the cursor is in the bearing field you can press the “R” key. Once the bearing is showing 105.3, press the Tab key, or select the Distance box with your mouse. The depth of these blocks is to be 35 metres, so type 35 into the Distance box. Now, we do not want the Multiple calculations to continue at the moment, so set the multiple value back to 1 and then click on the Apply button to position Point 10. 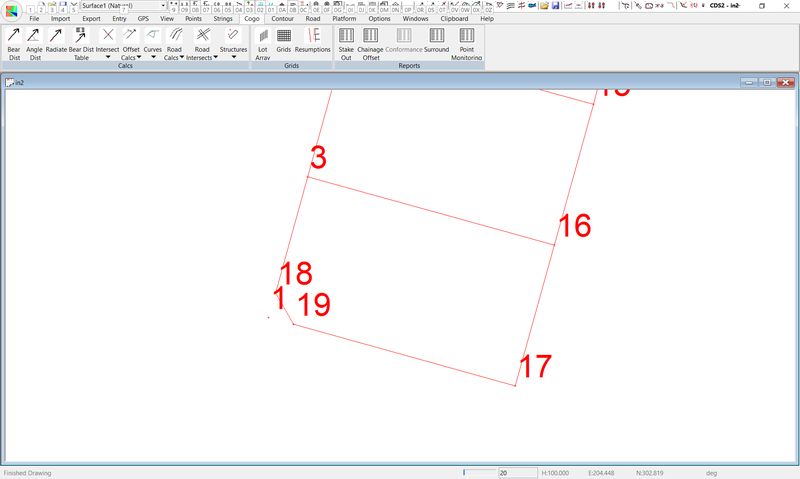 We now wish to calculate the back corners back down to where we started which means we have 7 points to calculate. 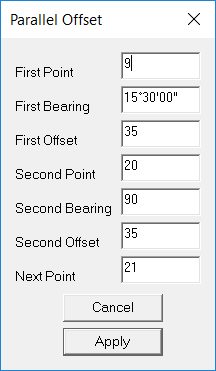 First, position the cursor in the Bearing box and press “R” to show a bearing of 195.3. Next set the Distance to be 20. Now enter the number 7 in the Multiple box. Now select Apply, and you will see points 11 through 17 calculated and saved. Now close down the Bearing and Distance box, either with the Cancel button, or the X icon. Now use Zoom (either press Z, or select the magnifying glass icon), and put a window around this batch of points you have just calculated to get a screen similar to that above. Next we need to add in some lines or Strings to show the boundaries of the lots we have just created. Pull down the Strings Menu and select the Add option to see the screen at right. This is where you add strings into the job, but before you get around to adding, you need to know about String Folders, and String Classes. You can choose what folder the string will live in. If you like to think in terms of ‘layers’, then folders are simply ‘string layers’. The important thing to understand is that CDS does not insist that your lines or strings be on the same layer as the points that make them up. Simply put, we recognise that your field party picks up and lays out Points rather than lines, but your drafting staff are more used to working with Lines, and that the points are of lesser importance to them. 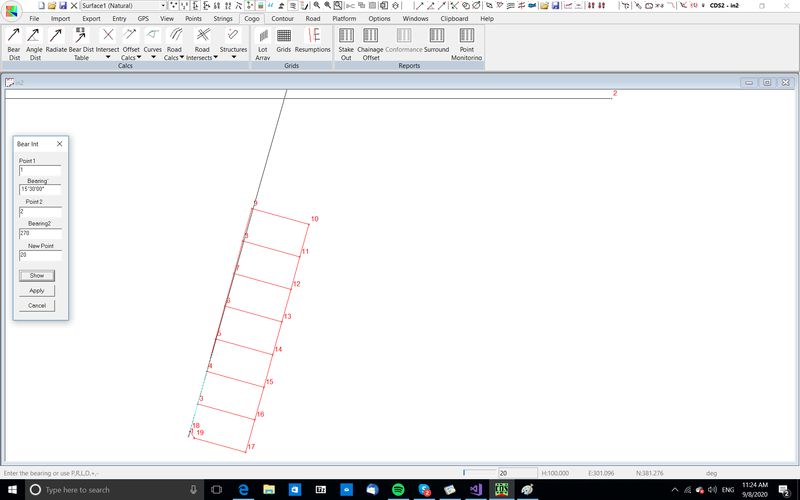 If you are of a mind to have the lines live on the point layer, then you can achieve that very simply by setting the folder name to be the same as the layer name. However, the ability to differentiate between points and lines gives you a considerable degree of flexibility in what you have displayed or printed at any time. As an example, consider you were working on a project such as a subdivision that is to be built in stages. It is conceivable that you might wish to place all the Points representing corners of the blocks onto a layer called “Corner” for example. If all the strings or lines were placed on the one layer called corners, it would be difficult to simply look at the blocks in Stage 3. However, if you use folders named Stage1, Stage2 and Stage3 for storing the relevant strings, it now becomes a simple matter to only display the blocks in Stage 3 by turning that folder ON and all the other folders off. If you wish to place the string in an existing folder you can use the pull down option to see the existing folder names, and select the one that suits your purposes. If you wish to create a new folder, simply type the name of the folder into the space provided. Note for the time being please restrict Folder names to 8 characters or less. As well as the folder, the Layer attribute gives you an additional means of grouping strings of the same type together and then easily determining how all members of that class will be displayed/printed. As an example of some uses of this facility, consider a subdivision that contains lots of different sizes as laid down under zoning guidelines. Say for example you had “normal” size lots, “super” lots and other lots to be used as “parks”. If you assigned the relevant strings around the boundaries of these lots to classes, you could then easily have all “Super” lots filled in and coloured red, all “Normal” lots filled in blue, and the “Park” lots coloured in green. 3. Why have both Folders and Layers? Simply to give you greater flexibility in how your job is controlled. If we continue the Staged development analogy from the Folders, the Class is the overriding attribute that determines how all strings in a particular class will be shown. The Folder can then be used to determine which strings belonging to a particular class will be displayed or printed at any given time. You need to give each string a name, or a number, or, in Foresight terminology an ID. The string ID can be any combination of the letters A through Z and the numbers 0 through 9, and we strongly recommend that you do not include any characters other than these in string names. It is possible to have more than one string with the same ID in a job. In the Field entitled Folder, you should see the name “lots”. You should be aware that you can store the string definitions in any folder you choose, but the default name of lots will be fine for this example, so ignore the folder field for the moment and concentrate on the String ID field. You MUST give each string you enter an ID which can be either a name, or a number, or a combination of the two. Here we are creating lots, or parcels of land and traditionally these are numbered, so lets start with and ID of Lot 1. Type “Lot 1” into the field. At this stage, we are not too concerned with Classes, so simply leave the default Class of 0. Likewise, we do not yet have a Deposited Plan, so leave that number blank. Again, we are not too worried about Pens or Linetypes at this stage, so skip over them and focus on the ‘entry window’. All that is required is that you enter each of the point numbers that make up the string. You may type in the numbers if you wish, and if you choose to do so you should separate each two numbers with a comma. Alternatively, you can point to the points you require with the cursor. In this case, the string with an ID of Lot 1 is made up of numbers 1,3,16,17,1 so you should enter them into the entry window. You will note that the start point (i.e. 1) has been entered again as the end point in this string and this forms what we term a “closed string”. If you wish to be able to determine the area enclosed by a string, you must use a ‘closed string’. Once the numbers are entered or picked from the screen, the string will be drawn on the screen for you to see, and as you enter each new number the next segment of the string will be drawn. The screen should appear as at right. If, as it should, your string appears to represent sensible boundaries of Lot 1 you can select the Apply button and the string will be stored away. The cursor will then switch back into the String ID field waiting for you to enter another String. If you now attempt to add in Lot 2, the dialogue box may be in your way, so simply drag the dialogue box across to the right hand side of the screen before you enter in Lot 2 which is made up of Points 3,4,15,16,3. We leave it to you to continue adding in the definitions for the strings up to Lot 7. Now, having done all this fine work, we suddenly realise that there is a small problem back at Lot 1. This is actually a corner lot, and the local council requires that all corner lots have a splayed (or truncated) corner, which we forgot to include. So, first we need to calculate the points that define the splay or truncation, and then we will need to change the string definition. To calculate the splay points you should use the Radiate option from the Cogo menu, so pull own Cogo, and select Radiate. The From Point should be 1 which you can either point to with the cursor, or type in from the keyboard. The first bearing is 15°30’ for a distance of 3.5 metres to calculate Point 18. Now you will notice with radiate that the “From Point” will remain at Point 1 rather than leaping to the last point calculated as in the Bearing & Distance routine we used earlier. Position the cursor in the Bearing field, and press the “R” key to swing the existing bearing 90° to the right. Now select Apply and you will see Point 19 calculated. Next you need to change the existing definition of the string with the ID of Lot 1. Pull down the Strings Menu and select Change. The dialogue box will appear waiting for you to identify the string you wish to change. You may pull down the list of String ID’s if you wish, and select Lot 1 from there. Alternatively you may select it by Pointing with your cursor to the string you want. If you do wish to point, it is important that you point to a unique part of the string. For instance, here if you wish to point to one of the side boundaries, you would point to the line between points 1 and 17 rather than the line between point 3 and 16 because this line 3-16 is also part of Lot 2, and so by definition is not unique to Lot 1. Once you have identified the string, the numbers 1,3,16,17,1 will appear and you should position your cursor in this field and alter the numbers to read 19,18,3,16,17,19. Then press the Show button to ensure you have specified it correctly, followed by Apply to save the new definition of Lot 1. At this stage your screen should look like the one at right. Now, the mysterious Point 2, which has been lurking up in the top right hand corner of the screen will come into play. Point 2 is actually a point on the boundary of an existing road that runs East-West, and our next step is to determine where that boundary will intersect with the frontage of the Lots we have defined so far. To do this we can use the intersection of two known bearings. Pull Down the Cogo Menu and select the option titled Intersect Bearing & Distance, and then select the item titled 2 Bearing Intersection. A dialogue box will appear as seen in the screen below. Point 1 is in fact 1, and the bearing is 15°30. Point 2 in this case is 2, and the bearing from there is 270°. 20 is fine for the New Point. If you wish to see what will result from these figures without actually creating the point you can press the Show button. 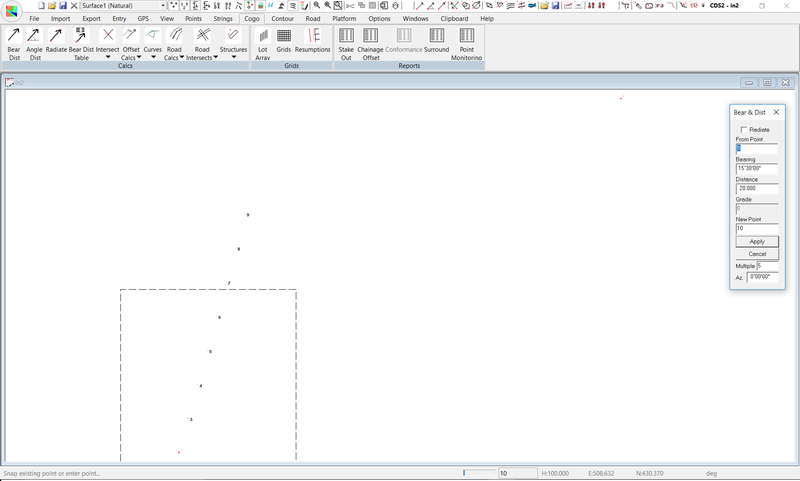 As you can see the program will draw two lines to indicate the bearings you have entered, and to indicate where the new point will appear. As long as this looks OK you can press the Apply button and point 20 will be stored at the intersection of the two boundaries. At this point it is wise to be on the safe side and do a quick check to find out how much we have left between Point 9 and Point 20 before we go off blindly creating more blocks. Press the ‘J’ key to instigate a Join. Enter the points 9 and 20 respectively and calculate as seen in the screen at right. As well as noting the distance, it is very important that you get in the habit of checking that the bearing is also correct, and here it should be at 15°30’. Keep in mind as you are calculating that it is relatively easy to hit a wrong key, and for example if you had inadvertently keyed 15.50 for the bearing when you created point 20, you wouldn’t see the difference visually. If you develop the habit of checking often, you won’t find yourself in a mess later on trying to unravel where you actually made the error. While in this mode it would be worthwhile to check the join between 20 and 2 which should give a bearing of 90 and a distance of 194.535. Enough of the checking and back on with the calculations. Now with a distance of 67.5 metres left to the corner, it should be reasonably clear that you can either get 3 full blocks and a ‘funny little bit’, or two blocks with the possibility of something decent left on the corner. Before we go much further, we need to see where we can get a full depth block off both the street running North-South and the street running East West, and we can determine this by using an offset of 35 parallel to both streets. 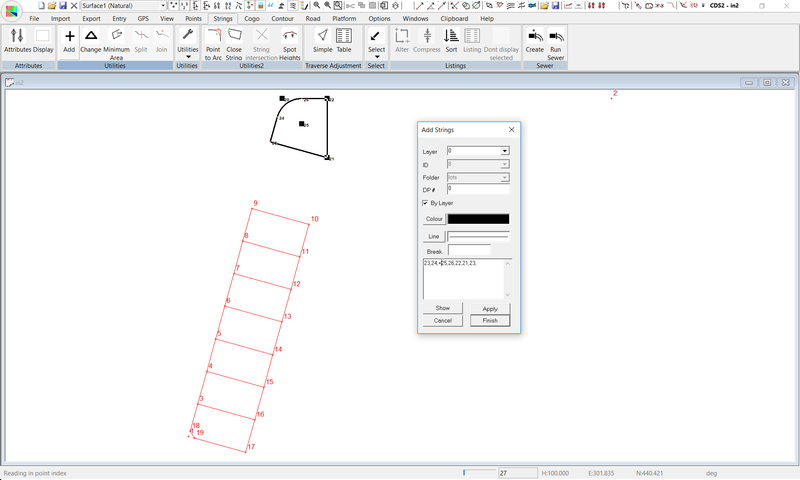 Pull down the Cogo menu, select the item entitled Offset Calcs, and then select the Parallel Offset option. A dialogue box will appear as seen in the screen below, and the values are as follows. Enter in these values, using Tab or the mouse to move between the fields, and then select the Apply button you will find Point 21 calculated. Back in Check mode again, you should press ‘J’ to do a join between 21 and 10, and you should get a bearing of 195°30, and a distance of 40.934. Now, since this is going to be a park, it might be decorative if we construct a curved boundary at the corner. Pull Down the Cogo Menu and select Curves followed by IP & Radius. Note that if it overlaps your points you can Drag the Dialog box over to the right hand side of the screen so it is out of the way. Your IP Point is 20. Once you have entered the two bearings the Deflection Angle will be calculated. Note: For the moment please don’t be alarmed if occasionally an angle or bearing displays as 89.5960 instead of the 90 it is meant to be - it is still calculating correctly, but there is something strange in how things are displayed - we will track it down and eradicate it, but until we do it does not affect the accuracy of the calculations. If you now position your cursor in the Radius field and enter a radius of 25, then press the Tab key, you will see all the other fields filled in with the relevant values. You may, if you wish, alter any of the other values and the radius will change accordingly. Basically, once you have fixed the deflection angle, you can fix one other parameter, and the curve will then be calculated for you. Here we will set a radius of 15 metres and accept the tangent of 11.406 that results. If you wish, you can select the Show button to get a preview of how the curve will fit, and then select the Apply button to store away the two tangent points and the centre point of the curve. Once the points have been stored, select the Cancel button to close down the curve calculator. Now that we have calculated all the points for the park, it is time to define its boundary as a string. Pull down the Strings Menu and Select Add. (If necessary, you can drag the dialog box to the right to clear the area you are interested in. Use the Folder “Lots” and use an ID of ‘Park’. Enter a Class of Park. You have learnt earlier in this exercise how to define Strings, so the only difference here is that the string has a curve in it. left handed or anti-clockwise about the centre ( - ). It is also recommended that you do not start defining a string on a curve tangent point. So here the points you need are 23, 24,+25, 26, 22,21,23. Note you can pick all points except the centre point with the cursor if you wish, but we recommend you type in the centre point complete with its sign. At the end of this process you might use the Show button to check what you have, and it should look similar to the screen at right. Use Apply to save it. We are now left with the decision of what to do with the area between Lot 7 and the corner park, and it seems a reasonable spot for a small commercial development so we might leave this area as one large block. Use the techniques you have learnt to Add in a String called Shops with a Class of “Retail” defined by points 9,23,21,10,9. It is often necessary to have a list of the various strings you have defined, and since the strings here define boundaries of parcels of land, it is also useful to have a record of the areas of each of the parcels. To do this we first need to select the strings we are interested in, and then list them, so pull down the Strings Menu and highlight the Select Option. You will see that there are a number of methods of selecting the strings you require, and for this exercise we will show you how to use the Range facility to select. If you pick Select a Range, you will see that each of the folders in the job is listed. If you wish to simply select all of the strings in a particular folder you can ‘tick’ the box adjacent to the name of the folder. If you wish to see what strings are in a particular folder, you can select the “plus” box to the left of the folder name, and this will expand the display to show a view of all the strings in that folder. Once you have selected the strings you require, pick OK.
Next pull down the Strings menu again, and now pick Listings. You will then be asked which type of listing you require, and a Full Listing is normal for presentation, so check that button. Next you will see the Wordpad program open a window, and the listing will be presented. You can use the Wordpad facilities to change fonts etc if you wish, and once you are happy with the format you should Save the document. 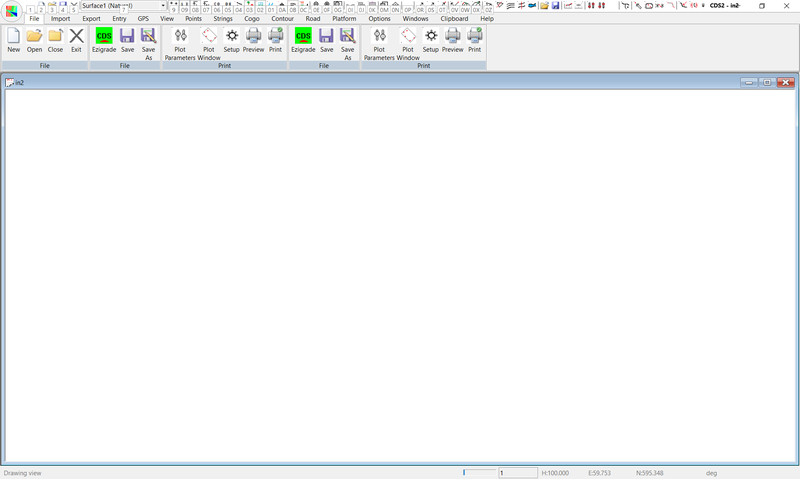 Note: to maintain compatibility with Win3.11 the report is written in Windows Write format, and while Wordpad knows how to read it, it cannot save a document in this particular format, so accept its suggestion of using another format, and either save the document as Text, or a Word document depending on your own needs. 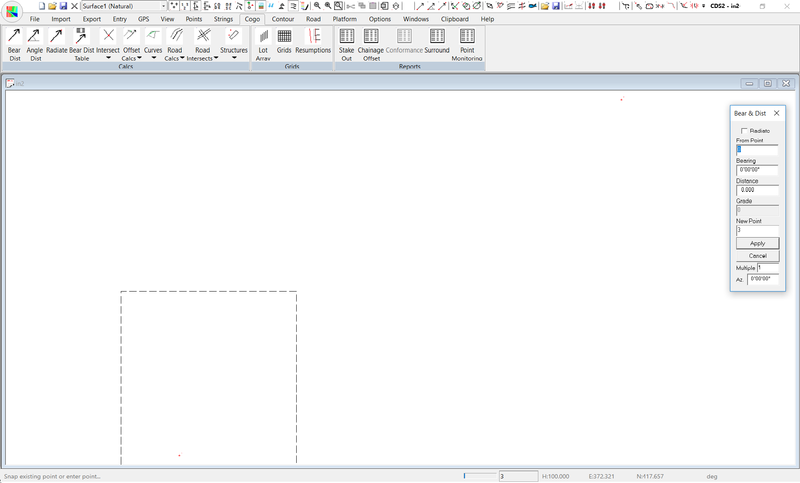 A text format will give you a report that can be easily inserted into drawings with Autocad or other CAD packages. The format of the listing can be seen from the sample below.